This photograph was included in “Bridgehampton”, a book written by Geoffrey Fleming, former director of the Bridgehampton Historical Society and now Director of Southold Historical Society. I consider Geoff a friend from the early days of the Bridgehampton Road Rallye and a reliable authority on the art, history and culture of the East End. 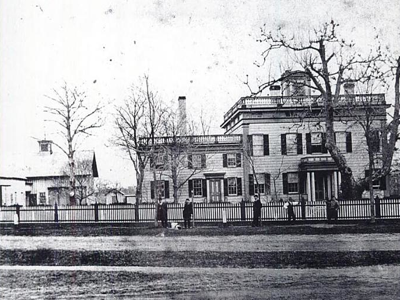 Here the Topping Rose House appears in all its glory in the late 19th Century as seen from across the Bridgehampton - Sag Harbor Turnpike. Many of the granite posts supporting the fence at that time are still on the site today. However, this entry focuses on the issue raised by some viewers that the roof had recently been removed. As you see in this image, there are no Third Floor windows. In fact the building had its roof “raised” or lifted to create a Third Floor many years after it was originally constructed. This photograph was taken yesterday to provide a look at the framing. Notice the brace starting at the floor of the attic, or Third Floor, and attaching to the stud near the base of the existing window. The window is now covered with plywood. 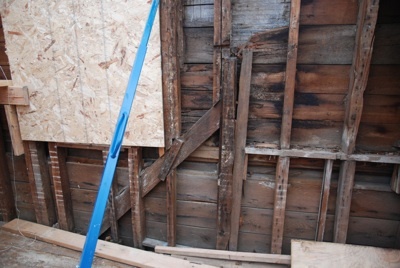 This framing detail reveals the original location of the brace to accommodate the original roof location, significantly lower than the present location. The new roof construction will bring the framing up to code and be consistent with the approved plans for the renovation and rehabilitation work.